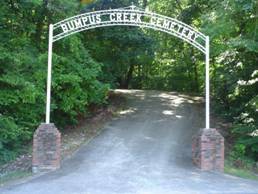 To reach the Bumpus Creek Cemetery from Florence, Alabama, travel Alabama Hwy 20 west and turn left onto County Road 14 (Waterloo Rd.) and travel to Waterloo, Alabama. County Road # 14 turns north in Waterloo. Turn right and follow County Road 14 (Bumpus Creek Road) 4.5 miles to the Bumpus Creek Free Will Baptist Church. 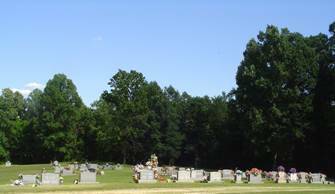 The Bumpus Creek Cemetery is located on Lauderdale County Road # 14 across from the Bumpus Creek Free Will Baptist Church. Across the road from the church is the concrete drive going up a rather steep hill to the cemetery. The annual homecoming & decoration day at Bumpus Creek is the second Sunday in June. Austin, Lillie L.; b. 29 Oct 1891, d. 17 Nov 1987, wife of Alfred T.
Benson, Lizzie S.; b. 24 Feb 1900, d. 11 Jan 1989, wife of John R.
Farley, Mary C.; b. 06 Oct 1907, d. 14 Sep 2001, wife of James T.
Keller, Geraldine; b. 09 Mar 1933, d. 09 Jan 2001, wife of Jesse F.
Michael, Jewel G.; b. 1907, d. 1995, wife of Marvin A. Price, Ruby M.(Highland); b. 04 Sep 1952, d. 02 Feb 1973, wife of Roger L.
Scott, Rosie A.; b. 11 Feb 1913, d. 12 Dec 1988 wife of Leonard A. Shook, Anna E.; b. 11 Dec 1898, d. 20 Oct 1994, wife of Wallace D.
Smith, Lorene H.; b. 06 Jun 1917, d. 09 Apr 1994, wife of James E.